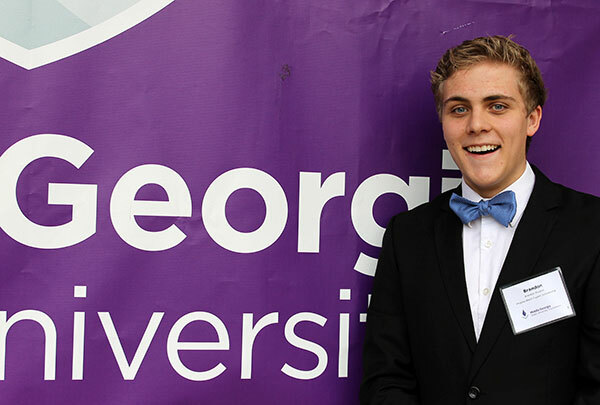 Brandon Poulton, a Middle Georgia State Foundation scholarship recipient, wants to help make the world a better place through an engineering career. Full Name: Brandon George Poulton. High School: West Laurens High School, where he was president of FBLA (Future Business Leaders of America); a member of LYL (Laurens Youth Leadership); advisor for Citizens Bank Advisory Council; senior patrol leader and Eagle Scout in Boy Scouts; and hospital volunteer. Family:"Brett Poulton is my awesome little brother and Anthea Poulton is my unbelievable mother." Degree Objective: Regents Engineering Transfer Program. "I hope to graduate with a bachelor's degree from Georgia Tech in Electrical Engineering and Material Science Engineering." Primary Campus: Macon and Dublin. Activities: "I help with an organization called TrailLife (a Christian organization helping to raise up the next generation of Christian men) and work on the church camera crew. I hope to help start a Christian ministry at Middle Georgia State." Career Goals: "Finding water in countries like South Africa costs too much. I want to become an electrical engineer and material science engineer so that I can cut costs, save on labor and build stronger materials that last longer. Building carbon fiber reinforced diamond coated ceramic well drilling bits is one project I hope to work on someday." He chose Middle Georgia State University because ... "Middle Georgia State University is going places! The faculty and staff are great, from the maintenance crew to the professors, who spend genuine time with students after classes." So far, his greatest academic experience at Middle Georgia State has been ... "When I enrolled I was lucky enough to spend some time on the Eastman Campus with Professor Rick Krontz working on the James Webb Telescope. This is an opportunity than no other university in Georgia could have ever provided." To him, "greatness" means ... "In the time I have in between classes and studying I love to explore the world of electronics. From quad copters to fiber optic networks, my interests are always changing. MGA has provided an environment in which people like me thrive. Great professors, a robotics lab, composites lab, and many other student-centered aids are all a student like me could ask for." The one person he'd most like to meet is ... "Elon Musk. He is shaping the way we think of green means of transport, the internet and space travel within our solar system." Five years from now ... "I hope to have started a company with products that in some way improves lives. Shoot for the stars and you might land on the moon."